Home » Answers to Common Questions » What is Neosurf and how to make a deposit at online casino to play pokies? What is Neosurf and how to make a deposit at online casino to play pokies? Though most of you might know the answer to this question but for those who asked us repeatedly to answer this were new punters from Australia and here is the answer. Neosurf is a new online payment method now available at casino sites to make a deposit and play pokies in real money. Actually it is not new for online buyers as Neosurf is a very popular online payment system in France, that allows the customers to pay for their goods and services on the Internet. Owned by the French company Neosurf card SAS, it offers excellent prepaid cards, thanks to which, online casino players can effectively make their deposits in a reliable and secure way. Neosurf is a type of prepaid cards that you can use to pay for goods and services online or use it at the online casino to play pokies with and place a bet on a game. As a pre-paid card system Neosurf cards or tickets need to be purchased at retailers such as tobacconists, newsagents, gas stations, groceries, super markets etc. 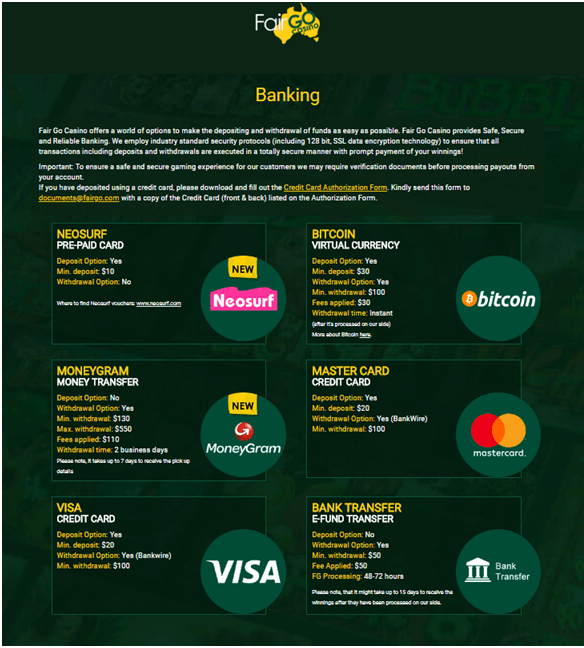 A list of all Neosurf pre-paid card points of sale in Australia and other countries can be found on the Neosurf website here. How does NeoSurf Prepaid card work? It’s simple to use and make a deposit. No need to sign up or register to the service or give out any of your personal financial details. This means you can purchase the card completely anonymously. Just scratch the 10 digit code on your purchased card and use it immediately to make online payments. Payments made with the Neosurf card are immediately credited to the account of the receiving party instantly like at an online casino and the amount valueis immediately deducted from the card’s value. The Neosurf card also come in prepaid Master card format called Neocash which can be used as worldwide MasterCard payment service in millions of offline and online stores. The NeoCash pre-paid MasterCard can be uploaded with funds by bank transfer, credit card or with cash by purchasing a Neosurf card. How to fund your online casino account with Neo Surf? There are many online casinos now accepting this mode of payment. As an example Aussie friendly online casino Fair Go and Emu casino accept Neosurf payment mode. This pre-paid voucher that is simple to use. 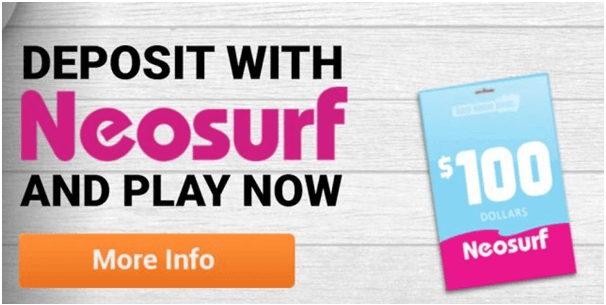 Players can purchase a Neosurf card at one of thousands of retail locations across Australia and around the world, and then use it to top-up their online casino account. After having purchased a Neosurf pre-paid card simply opt for Neosurf as the desired payment option on the cashier or banking page of an online casino. A pop-up window will appear asking to fill in the amount to deposit and the 10-digit Neosurf validation code. By subsequently clicking ‘confirm’ the money will be immediately transferred to the casino account and is ready to play pokies with. With a NeoCash MasterCard a deposit on an online casino account can also be made by choosing ‘Credit Cards’ as the preferred depositing method after which the instructions need to be followed to complete the payment. Normally online casinos don’t charge any additional fees for using Neosurf as payment option. 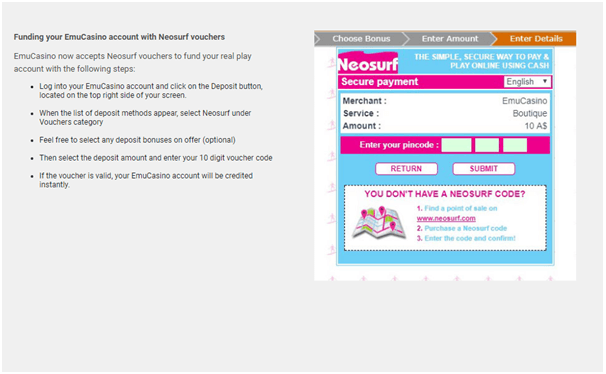 Important to note is that you cannot make a withdraw at the casino with Neosurf. In addition, Fair Go Casino is now also accepting Neocash MasterCard payments. Neocash is a rechargeable pre-paid debit card that allows consumers to make online payments, but without the need to open a bank account. Neocash boasts the same security measures and features as a standard MasterCard, but like Neosurf pre-paid cards, users are not required to provide personal details in order to obtain one, making it ideal for those who wish to remain anonymous. To celebrate the launch of Neosurf, Fair Go Casino has rolled out a generous bonus offer for those depositing with the pre-paid voucher. You can contact their customer support for more details. Is Neo Surf Safe to use at online casinos? Payments made with Neosurf are safe as all transactions are 128-bits encrypted. The Neosurf payments arrive instantly on the casino account. The system can be an ideal tool to control expenses in online casinos as the value of a Neosurf card can be used only once. Also as you are anonymous when buying the Neosurf prepaid card you don’t need any of your personal information to leak out and your full privacy is maintained. You need to register at the NeoCash and MyNeosurf website to buy online prepaid cards and provide the service with some personal information. 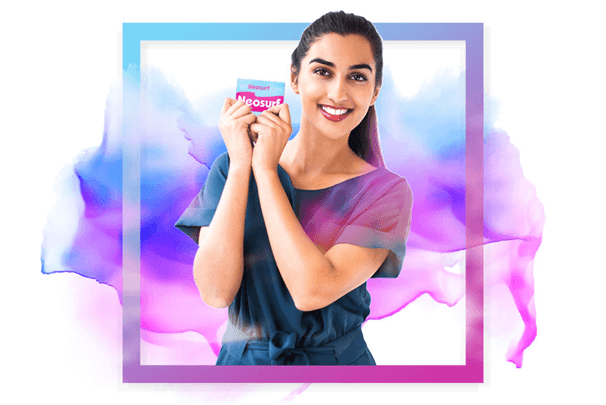 Although for most of the features Neosurf offers no fees are charged especially when the ‘classic’ Neosurf pre-paid card is used for some other options the user needs to pay a commission. But you can go out physically to a Neosurf selling point nearby to obtain the card if the use of MyNeosurf and registration for this service is not what you want. Can you explain me about the Roulette wheel and which is best to play? 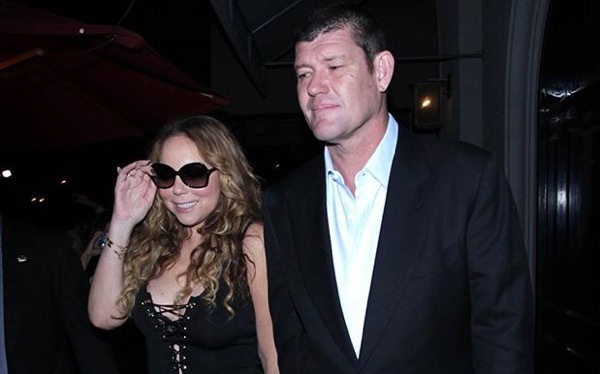 What Were the Worst Crown Resorts Scandals?